Tue., Oct. 19, 2010, 11:48 a.m.
And now it would seem safe to add “The Very Hungry Caterpillar” to that list. The 1969 children's classic by Eric Carle became an instant hit with a roomful of Kyrgyz preschoolers this week, read to them by Tech Sgt. 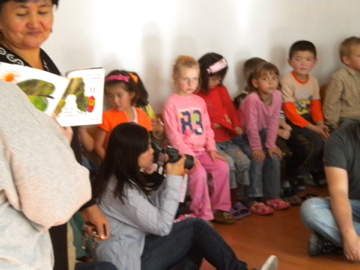 Trish Newton and translated into Russian and native Kyrgyz by an Air Force interpreter and the preschool's principal. At one point in the story, as the caterpillar ate through a bunch of strawberries after chomping through other fruits and vegetables four days in a row, a young boy laughed and began talking rapidly. Others in the classroom began laughing, too. The interpreter explained that the boy was amused that something so small could eat so much and still be so hungry. Later, of course, the youngsters reacted with soft “oooohs” of approval as the story ends and – SPOILER ALERT – the caterpillar emerges from its cocoon as a beautiful butterfly. Newton was among a handful of Manas volunteers journeying to the Solnyshko preschool in a small impoverished village about 20 miles from the air base to deliver winter coats and blankets donated by Spokane-area families and churches. The coat-and-blanket drive was organized by KHQ TV. The donated supplies were flown to Kyrgyzstan aboard a Fairchild-based KC-135 deployed to Manas last week. Military servicemen and women have been volunteering regularly at schools, orphanages and women's centers in communities near the base as part of an outreach effort. Posted Oct. 19, 2010, 11:48 a.m.